– How many times have you deleted a file in your PC and then discovered a need for it? It has happened to me a number of times. I would then try to look for back up copies but if I haven’t backed it up, I look for a free software to recover them. I had recently discovered that I deleted an important document from my computer.I knew that I didn’t have a back up copy and I started searching for a free data recovery software at Techblissonline.We have posted reviews and download links for several free data recovery software including photo recovery software to recover deleted files. I however decided to try a new software this time. It was then I discovered the free Pandora recovery software, which can recover deleted files from either NTFS or FAT-formatted disk volume. 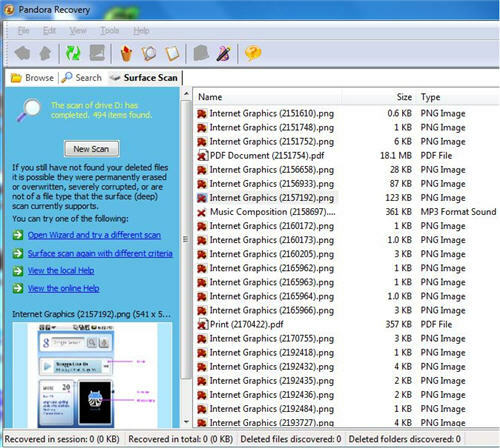 After you download and install it on the computer, you will have to run Pandora recovery’s surface scan to scan the computer hard drive and build an index of all files, including the deleted files and folders. 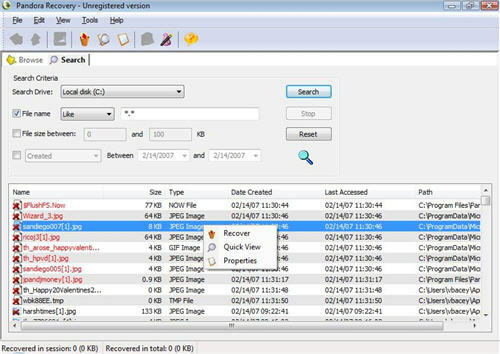 Once the scanning is complete, you may recover deleted files by either browsing through the hierarchy of existing and deleted files, or using the search option to find the files using either the full or partial file names. Pandora recovery also lets you recover files using file size, creation date or last access date. However, many may not find any use for these options as they would probably remember only the file names. This free data recovery software can also be used to recover any images, movie files or files of any other type.The feature that I appreciated the most was the ability to preview deleted files. The quick viewer in Pandora file recovery software lets you preview any deleted image or text file, before you recover them. You can recover deleted files from reformatted media or from discs with damaged or missing file allocation table.You may even recover files whose MFT record has been reused by the operating system. However, Pandora recovery does not use information contained in the file allocation table and hence it cannot determine the file name, its attributes or the file path. The preview functionality proved to be very useful, as Pandora recovery cannot find the file name. Here are some prominent features of Pandora data recovery software. 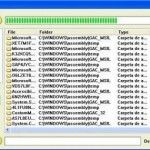 Ability to browse or search deleted files. Ability to view file properties like file type, deletion date, date created, date modified etc. Right click on the file and click “Properties” to view them. 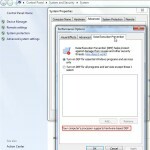 Ability to view properties of all logical drives on the computer i.e. drive letter, volume label, file system etc. 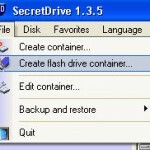 Ability to recover deleted files to either the local drive or any remote network drive including flash drive. Developers of Pandora recovery recommend recovery of deleted files to a secondary hard drive, a network drive, USB Flash drive, or other external media for better success rates. Pandora data recovery works on windows 7, vista, XP, windows 2003 and windows 2000. It recognizes FAT16, FAT32, NTFS, NTFS5 and NTFS/EFS file systems. Limitations – Success rate depends on the extent the disk space occupied by the deleted files had been overwritten/reused by the file system. Lesser the overwrite percentage, greater is the recovery success rate! Download Pandora data recovery software and recover deleted files from your PC. What files may be recovered using Pandora Data Recovery Software? 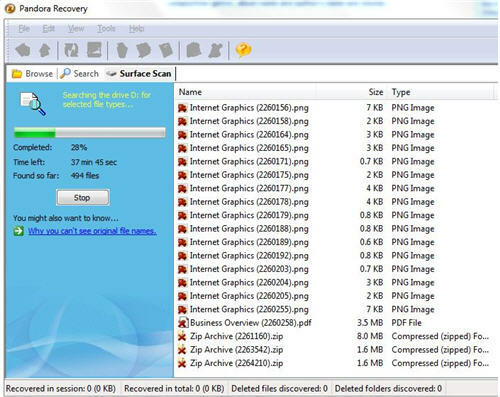 Recover files of any type including the following, using the free data Recovery Software. Images / Photos – JPEG images (*.JPG), PNG images (*.PNG), GIF images (*.GIF), BMP images (*.BMP). Music / Sound – MP3 files (*.MP3). Free download Pandora data recovery software. Pandora Recovery|Recover your lost photos for FREE.